The world's first personal supercomputer - a machine 250 times faster than the average PC - has been unveiled in Britain. It will go on sale for more than pound £4000 ($9100), beyond the reach of most consumers but a fraction of what computers with similar capabilities usually cost. The supercomputers, released in the US last month, will initially be sold to the scientific and research community and universities. 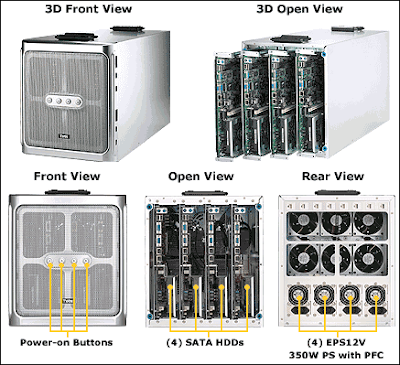 PC maker Dell, however, said it would soon be mass-producing them for the general consumer market. The Tesla supercomputers have such immense power they should be able to help doctors to process the results for brain and body scans much more quickly, allowing them to tell patients within hours instead of days whether they have a tumour. Scientists believe they could help to find cures for diseases such as cancer and malaria faster than traditional research, because they can run hundreds of thousands of simulations to create a shortlist of the drugs most likely to offer a potential cure. Previous supercomputers have been massive systems consisting of thousands of machines housed in huge rooms, costing millions to build and maintain. 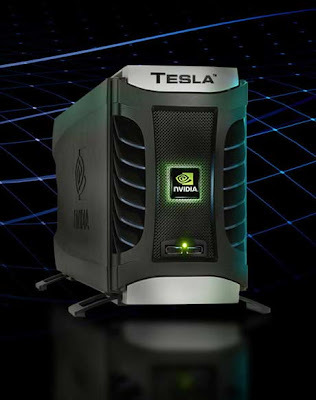 Tesla personal supercomputers look like the PCs many people already have in their homes. "These supercomputers can improve the time it takes to process information by 1000 times," Dr Kirk said. "If you imagine it takes a week to get a result (from running an experiment), you can only do it 52 times a year. If it takes you minutes, you can do it constantly, and learn just as much in a day." The new computers use innovative "graphics processing units" - a technological breakthrough, the company says, that could bring lightning speeds to the next generation of computers for the consumer market.